Acquiring new customers is important – but can be expensive. On the other hand, ensuring existing customers keep coming back is a lot more cost effective. This fact lies at the heart of retention marketing. Loyalty programs that incentivise and reward customers for ongoing patronage are a popular retention strategy. However, for a loyalty program to be effective, the benefits it delivers customers also need to be communicated effectively. Electronic Direct Mail, or EDM, is a powerful tool to ensure an existing customer database is engaged on a regular basis with personalised, relevant and timely communications. These 5 examples of successful EDM campaigns from the past year show how innovative uses of email are still able to delight customers and keep them coming back. With BP’s Velocity Frequent Flyer program, points are earned each time a customer fills their car up with petrol. Points can then be redeemed for fuel discounts, cheaper flights, or at a range of online retailers. In the lead up to Christmas, BP launched an automated email marketing campaign aimed at its Velocity Frequent Flyer members. Customers purchasing fuel 4 times would be rewarded with 1,600 bonus Velocity points! Email personalisation is critical – and BP excelled at this by automatically displaying important membership information in the body of the emails. Details, including the number of points already accumulated, loyalty status, and the closest BP service stations to their home, were all incorporated into the message – ensuring the emails were highly relevant to each recipient. The best part was that the activation of the offer required just one click – ensuring easy reward redemption and helping BP increase customer retention levels. Uber gets it – their customers are busy. Anything they can do to make life a little easier for them will be noticed, resulting in increased retention. It’s that sort of foresight that lies behind one of Uber’s recent email marketing campaigns. For regular passengers, Uber sends out promotion codes that can be redeemed for discounted rides. But there’s a problem. Many recipients forget to redeem the code before their next journey, missing out on the discount and perhaps using a different service. 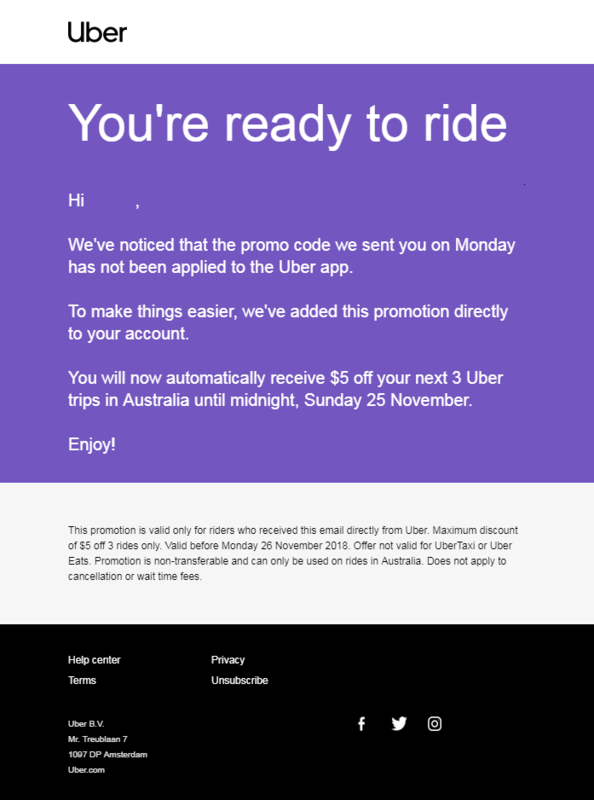 To remedy this, should the customer forget to apply the discount, Uber takes the initiative by applying the promotion code on behalf of the customer, so the discount will automatically apply. Steps like this endear a brand to its customers. It shows the brand wants to reward loyalty, while at the same time making its processes as seamless as possible. Some products don’t easily lend themselves to establishing strong bases of loyal customers. Toilet paper is one such product! However, that hasn’t stopped the team at WHO GIVES A CRAP. For these guys, toilet paper is so much more than the standard roll. This is a company with a strong social conscience. All products are made with 100% recycled paper. Additionally, half of all profits are spent increasing access to toilets for the 40% of the world’s population who still don’t have this basic necessity. So how does a company enhance brand loyalty, while simultaneously educating the public about the important causes it believes in? By bringing a wonderful sense of fun and humour to everything they do! And most of all, being down right honest. 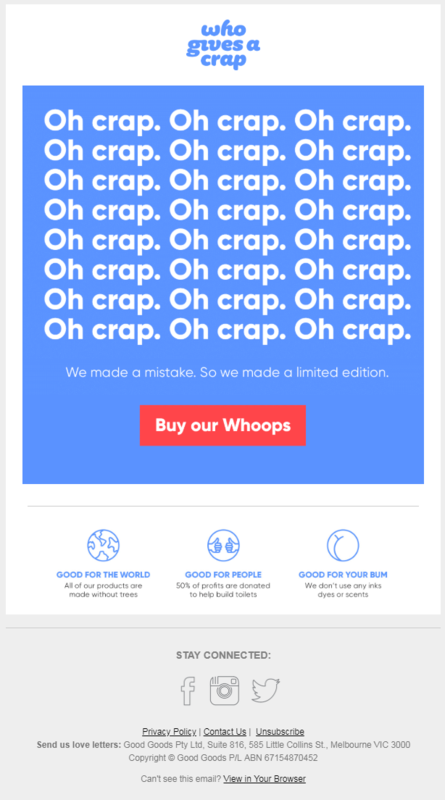 WHO GIVES A CRAP uses their brand name to create humour in their email marketing campaigns to engage customers with their latest offer and bring a smile to everyone’s face. The honesty really shines through. Readers can’t help but relate to the funny story about a mistake that leads to a ‘limited edition’ product. Through honesty and humour, WHO GIVES A CRAP ensures the brand remains front and centre in customers’ minds – so they’ll keep coming back for more toilet paper with a conscience. After all, who doesn’t like a good laugh? It’s not just national brands using email to drive customer retention. Many businesses rely on geographically local engagement. Our Place on Darling is more than just a pub. Its goal is to position itself as the centre for the local Balmain community in Sydney’s Inner West. Getting to the know the locals is an essential step towards achieving that goal. Through running regular events that bring locals together, a business can integrate itself into a community and establish a strong, loyal customer base. Email is an ideal tool to inform the local community about upcoming events. As such, email becomes about something much more than the company. It becomes something akin to a community newspaper. Once your customers value your business, and the constructive role it plays in the life of the community, customer retention rates will climb accordingly. For any business implementing an automated EDM strategy, the “welcome email” is usually the first step. While many “welcome emails” contain standard information about the customer’s account, some take the opportunity to use them as a way to begin building brand loyalty from the get-go. This is the case with Naked Wines. From their initial engagement, they begin treating newly signed-up members as long-term, loyal customers. From the outset, people are introduced to the “Angel” reward program and are enticed with a free gift with their next purchase. Even though the new member hasn’t yet qualified for “Angel” status, they are made aware of the benefits this loyalty program brings, such as reduced rates on certain wines and free gifts at Christmas time. This strategy builds strong brand loyalty from the beginning, helping ensure customers keep coming back to the site to see if they qualify for “Angel” status and what other special offers are available. Naked Wines also understands not all its customers are wine experts, and some are too busy to spend a lot of time contemplating which products to select. They therefore make the process easier by pre-selecting a range of wines that will have broad appeal. What about your business? Are you a ‘top-5’er? Each of these top 5 innovative EDM campaigns from 2018 shows how email is still a powerful marketing tool when used the right way. To drive significant improvements to your customer retention rates, partner with Blue Star DIRECT. Our expertise in designing and implementing effective email strategies will ensure your customers keep coming back! Contact Blue Star DIRECT to begin planning your email campaigns today, to inspire your customers and become as effective at marketing as these five examples.